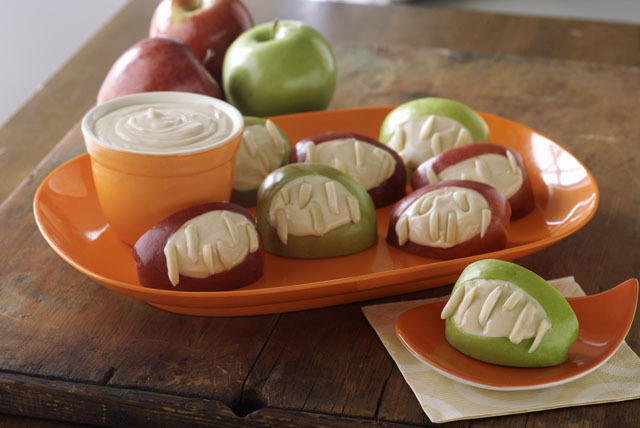 Discover a recipe that's both spooky and scrumptious with these Apple Monster Mouths. A delicious combo of sweetened cream cheese, apples and almonds, guests will grin when they see these Apple Monster Mouths on the Halloween buffet table. Beat cream cheese with mixer until creamy. Add sugar and vanilla; mix well. Cut thin wedge in peel side of each apple piece; fill with 1 tsp. cream cheese mixture. Insert 4 to 6 nuts in cream cheese mixture in each apple to resemble teeth. Spoon remaining cream cheese mixture into serving bowl. Serve with apples for dipping. Store any leftovers in covered container in refrigerator.